We are experts in tree stump grinding and dedicated to finding the best solutions to meet your landscaping needs. 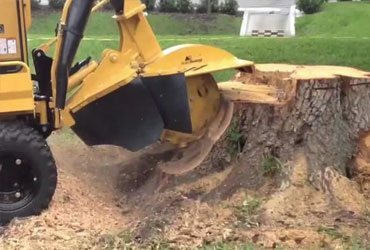 Stump grinding is the most efficient method for removal of tree stumps without any damage to existing foliage or landscaping. Stump grinding does not actually grind the wood. Rather, the wood is cut using high RPM carbide teeth attached to a cutter wheel that moves back and forth until the stump is finally gone. Our licensed team of experts can handle a variety of tree care services for you. We plant trees, take care of your existing trees or remove any unwanted stumps or trees from your property. Contact us today!